We as musicians are all familiar with metronomes in a traditional sense — love them or hate them, they are a tool that have been used as an aural guide to keep our performances precisely on tempo at all times. Unfortunately, because of it’s singleness of purpose, the metronome has been used as an audible reference and not truly given a revision since they were initially created in the 9th century. Flashback to 2015, a small German company, called Soundbrenner took to Indiegogo to introduce its adapted concept version of the centuries outdated metronome. Since the campaign’s launch, the product was rush-funded by excited musicians who were eager to try the idea for themselves. Now, 3 years later, we’ve been given the opportunity to try one for ourselves and let us determine first hand whether it lives up to the hype — and boy, did it ever. When it comes to design, the Soundbrenner Pulse is a great-looking device. Out of the package (which is also visibly appealing by the way), the pulse itself reveals itself front and center to introduce itself as your new best friend. 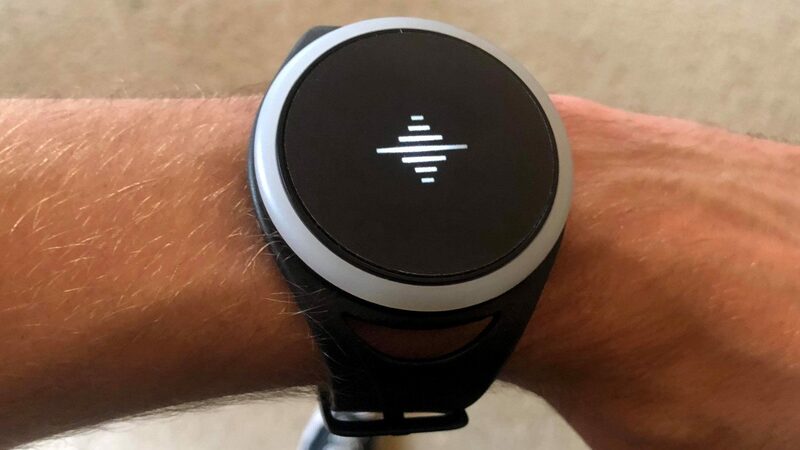 The device itself is a circular disc which was relatively larger than initially expected, but not at all too large for users who wish to wear it on their wrists like a watch. Out of the box, the Pulse contained no initial charge. We are unsure whether this simply had to do with the fact that this device has been sitting in a box unused for a couple of years, or whether they are shipped like that — but we assume the prior is the most likely case. When powered up, a glowing white three dash logo for the Pulse lights up as a visual reference for charge and also tempo. Finally a rotary disc around the perimeter for more control over tempo speed and other functionality. What impressed us most about the device though was how slim the company managed to keep it while also boasting a pulse vibration mechanism that is 7x more powerful than that of a smartphone. Inside is also a small manual, with basic instructions and information for downloading the “Pulse” smartphone app for further controls, which we will dive into more later and two bands: one small one for wrist or arm wear, and one large band for wearing the pulse around larger parts of the body such as the torso, waist, or upper arm. Upon first use, the Soundbrenner Pulse is slightly awkward. The idea of playing your instrument alongside a vibrating haptic pulse on your skin appears easy to the untrained eye. But after growing up with your typical aural metronomes, it absolutely takes some getting used to — diverting your attention from where it’s expected at your ears, to the location of the Pulse. After about 30 minutes or so into playing, it became much easier. The pulse itself is indeed very strong and absolutely lives up to the advertised ‘7x the strength of your smartphone’ model. Additionally, the company seemed to have tuned the variability perfectly because even at its maximum power, the haptic is never overbearing. The tempo pace is where we found our only concern within the Soundbrenner Pulse — for the most part, it is steady and precise. But every once in a while, especially at slower tempos below 100bpm, the tempo would hiccup and trip on one beat, but immediately pick itself up again to maintain its original integrity. To some, this is a very minor detail, but to others, this could make or break the device as a whole. The free smartphone app is a tool that is a necessity in order to use the Soundbrenner Pulse to its utmost functionality. It includes features like changing the color palette displayed on the lights, or setting note values and duration of each vibration, integration and sync with other Pulse owners, and setlist control. However, for users who will be using this device at its most basic metronome function, those can all be accomplished without pulling out your phone. For a device revolutionizing the way we use a metronome, eliminating problems like click bleed when recording, one would likely expect a price at least in the triple-digits. Although it has made it quite close, this is not the case with the Soundbrenner Pulse. Right now, you can pick one up for yourself straight from Amazon for $99, which, we think, is an absolute steal.